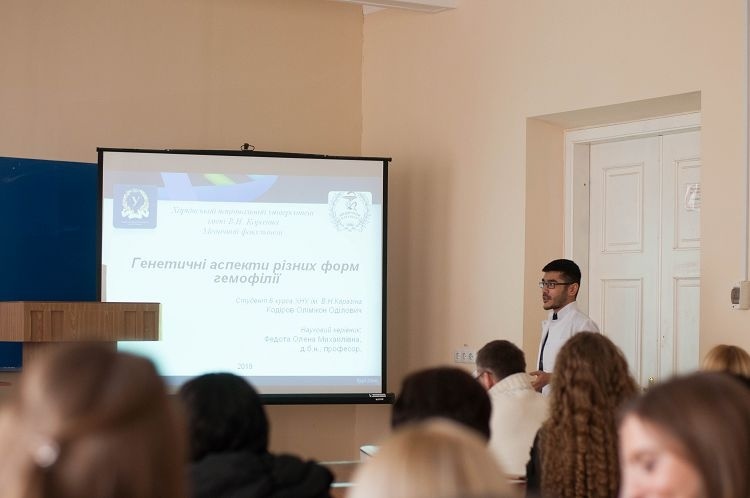 First session of the Ukrainian competition of student's scientific works on the specialty "Medicine"
First session of the Ukrainian competition of student's scientific works on the specialty "Medicine" dedicated to the 10-th anniversary of the Department of Hygiene and Social Medicine foundation was held on the 17-th of January, 2019, on the basis of the School of Medicine of V. N. Karazin Kharkiv National University. The competition was attended by 12 students of 2-6th years of study who presented their scientific developments. 1 - Saveleva L. Peculiarities of health preserving behavior and student youth health status and their impact on academic success. 1- Maystrenko J. Influence of the chemical structure of preparations of glucocorticosteroids on the state of the microflora of the bronchopulmonary system in children suffering from bronchial asthma. (Academic adviser: MD, Full Professor, Chernusky V.G.). Congratulations to the winners and their academic advisers on significant achievements and further successful scientific activity in the field!